Tottenham Hotspur 4 Watford 0, 08/04/2017. White Hart Lane, Premier League. 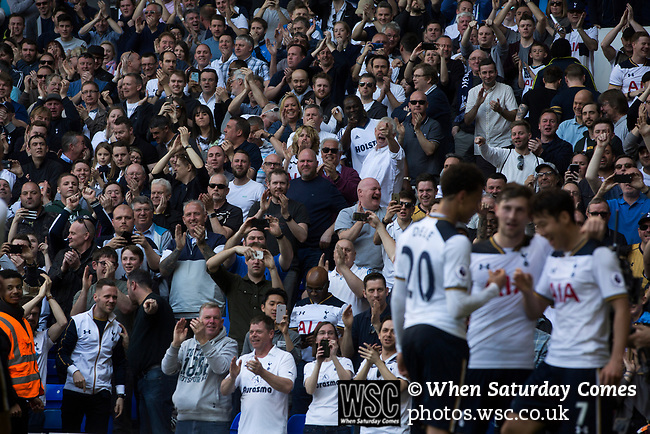 Supporters in the East Stand celebrating as Heung-min Son scores his team's third goal as Tottenham Hotspur took on Watford in an English Premier League match at White Hart Lane. Spurs were due to make an announcement in April 2016 regarding when they would move out of their historic home and relocate to Wembley as their new stadium was completed. Spurs won this match 4-0 watched by a crowd of 31,706, a reduced attendance figure due to the ongoing ground redevelopment. Photo by Colin McPherson.